Graphic Impact combines lasers and full color printing that allows us to print directly onto acrylic. There are almost an infinite number of awards, and plaques available. Corporations choose this exclusive product since logo can be part of the process and may even be dimensional. This digital acrylic printing process produces brilliant photographic-quality color. 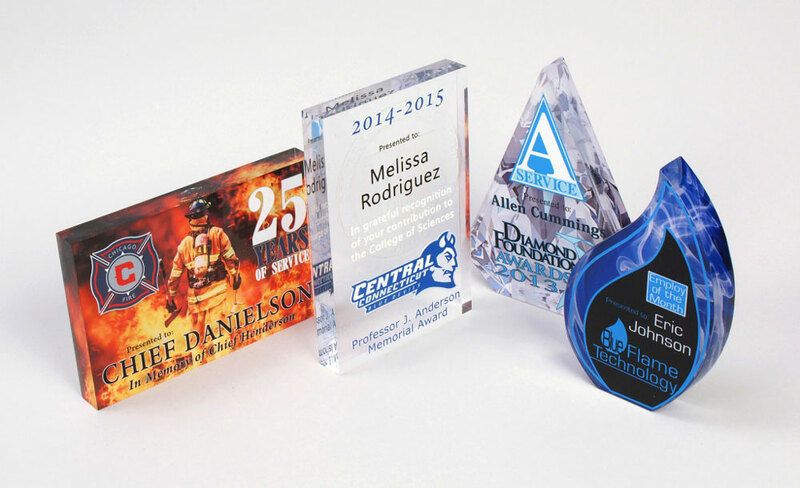 We even offer a white ink and clear coating option to give your awards added durability, plus reverse printing on the back side to give your acrylic pieces added depth. With our UV LED printers, create images and text in a genuine opaque white or use the white as a primer for crisp, vibrant images on clear and colored acrylic.